Long before the grim darkness of the 41st millennium was a time of myth and legend, where god-like beings met in a monumental battle of brother against brother. Rooted in one of the most important periods of European history, the Thirty Years’ War 1618-1648, Wallenstein focuses on the German princedoms, split into catholic and protestantic parties, each involved in religious and political conflicts. Players take on the roles of Gustav Adolf King of Sweden, Albrecht von Wallenstein, and other famous leaders of the era in their quest for power and prestige. Rex: Final Days of an Empire, a reimagined version of Dune set in Fantasy Flight's Twilight Imperium universe, is a board game of negotiation, betrayal, and warfare in which 3-6 players take control of great interstellar civilizations, competing for dominance of the galaxy's crumbling imperial city. Set 3,000 years before the events of Twilight Imperium, Rex tells the story of the last days of the Lazax empire, while presenting players with compelling asymmetrical racial abilities and exciting opportunities for diplomacy, deception, and tactical mastery. An epic strategy game of Medieval warfare. It is the sixteenth century in feudal Japan, where war rages across the land. Amid the chaos and conflict, you have risen to power as one of five warlords mighty enough to conquer and control the whole empire. Your victory depends on how expertly you extend your domain while defending it from your enemies. Nexus Ops is a frenzied board game of fierce battles and fantastic alien creatures. 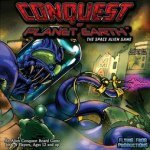 Two to four players control factions of corporate troops and indigenous life forms on an alien moon. Players deploy troops from their home base to explore the moon, mine resources, purchase troops, win battles, and fulfill missions to win the game. Bring fire and bring shell and heap all upon the pyre. With flame and gun we shall make an end to the withered husk that is human life. And in the blazing furnace of battle we shall forge anew the iron will of a yet stronger race. 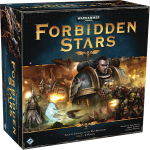 Fantasy Flight Games is proud to announce Forbidden Stars, a new Warhammer 40,000 board game of planetary conquest and war for two to four players!